THE BRILLUSTRATOR: Excelsior! Merry X-Mas 2014!! 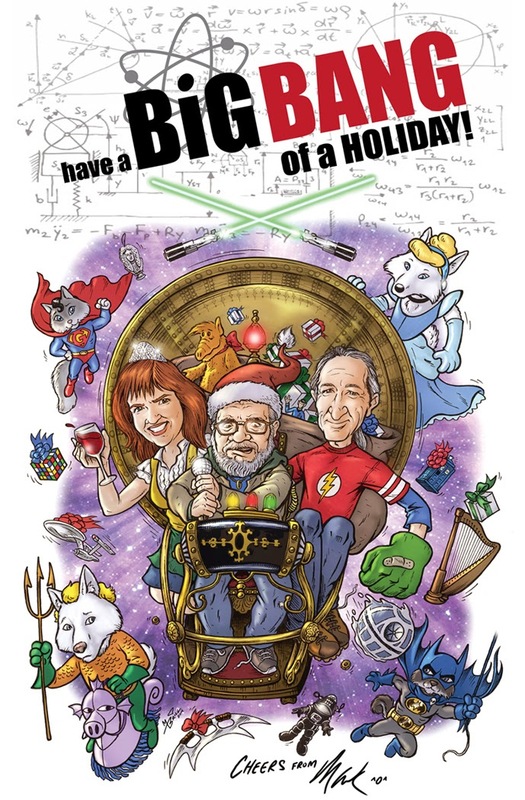 This is my annual themed Holiday card! 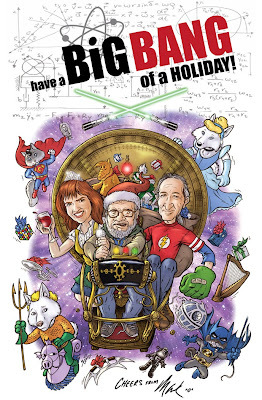 This year's theme, obviously, is "The Big Bang Theory"--chosen because the show has become such a large presence in our household. It literally plays constantly somewhere in our house. Yes, LITERALLY. Every item on the card is related to the show in some way. I had a lot of fun deciding how to dress the pets. We mere humans were easy to portray--I just used the three main characters. I am Leonard, and therefore get to fly the classic Time Machine--or as it was called in the show, "something Elton John would drive through the Everglades"; Bel is Penny, although wearing Amy's tiara, as Amy is actually her favorite character; and Edmund gets to be Sheldon! My favorite is poor ol' Gandalf who is dressed in Raj's Aquaman costume. Rounding out the "cast" are Gallifrey, who I made Zack (because he's pretty but not phenomenally smart) dressed as Superman, Merlyn dressed as Howard's "tiny Dark Knight" and Lily dressed as Bernadette in her Cinderella make-over costume. Our newest puppy makes a good Bernadette because she combines cuteness and bitchiness in the same way Bernie's portrayed on the show! Fa la la la la, la la la laaa!